Think of the words “Gas Station Sushi” and record your first impression on that phrase. 3. Associated impression.4. If a friend asked you about your opinion, what would you say? Now before we get into where this conversation is going, write those answer down. Alright, now that we’ve considered ‘what’ your perspective is, let’s follow it. I won’t pretend to know what your responses were but, for most, the thought of Gas Station Sushi generated a few opinions immediately. These initial impressions have some keen insights not only into a single person’s perspective, but also on a social case that can be made for some much harder issues. Let’s take a look. If you’re like me or many others, you saw the words ‘Gas Station Sushi’ and your first impression was likely not a favorable one. Without having any direct interest, a person may respond to the phrase with indifference or disinterest at a minimum, or may leap to assuming a great many things from the phrase at a maximum. If you felt indifferent, then this speaks for a cautious, open, and analytical mind whereas if you leapt to a conclusion, it may indicate that you trust your immediate instinct and impressions, draw conclusions from experiences with relation to subject matter, and likely behave in a headstrong manner. Further, if you remained indifferent, it may mean you struggle to direct your focus and energy into a single task. This exercise, for example, implicitly asks you to engage with it. Doing so minimally means you’re interest enough to participate, but not interested enough to give it your mind’s full focus. Pre-judging based on the phrase means you draw from experiences innately, and psychologically react to those experiences, especially bad ones, with a internalized, pre-determined action (that may or may not be a conscious decision). But what does this mean for society at large? Well, look around in your group of friends and in the social communities you participate in. Do you see more of the reserved, cautiously optomistic, critical thinkers? Or do you see the reactive, knee-jerk, hasty responders? Statistically speaking, you’re likely to encounter the later, not the former. Our society innately fears what it doesn’t understand and it rarely takes the time to see a situation through before making a decision on their action. This action doesn’t have to be a physical one, it can be a psychological action too. Can you think of where Gas Station Sushi fits into this? What if we replaced Gas Station Sushi with a particular ethnicity, gender, race, creed, or religion? Would the results be different? Here again, statistically speaking, they would not. Notoriously, we as humans have oppressed those whom we did not understand, or whom we judged too hastily. 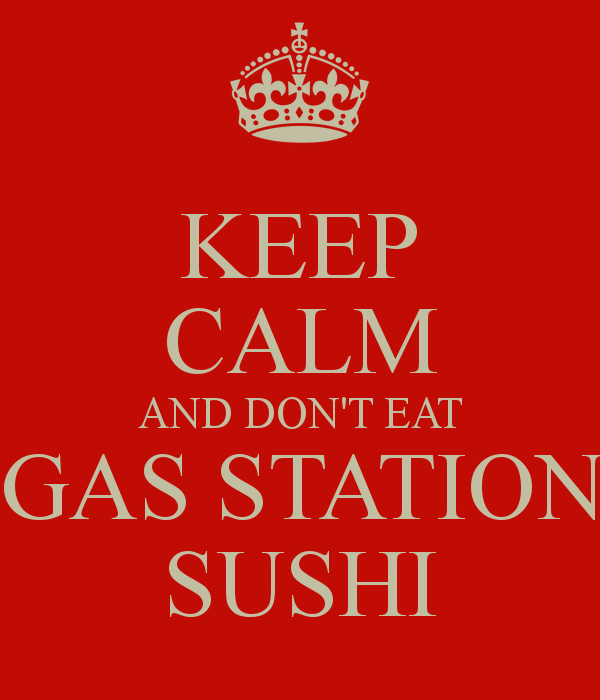 When humanity hears Gas Station Sushi, it reels at the thought. Indeed it may research and investigate it, but the stigma is born from an initial and widespread action. Only through aggressive, societal change, can this stigma be broken. By the way, it turns out, there’s a sushi vendor by the name of Lee’s Sushi that offers high quality sushi that is quite good, at local gas stations. This adage may have been a long winded version of “Don’t judge a book by its cover”, but truly when a cliche is uttered so often, the value in the lesson is lost. Categories: Philosophy, Random Stuff | Tags: box, humanity, labels, perspective, sushi, time | Permalink.